The Carry-All Pack Vest is designed for comfort and functionality. There is a row of 2" hook and loop, and 2 rows of 1" MOLLE straps on each side of the vest so accessories can be used with it. ID panels or patches can be attached to the top hook and loop or the side hook and loop of this vest. The vest has double girth straps and a chest strap so it will fit securely on the dog. 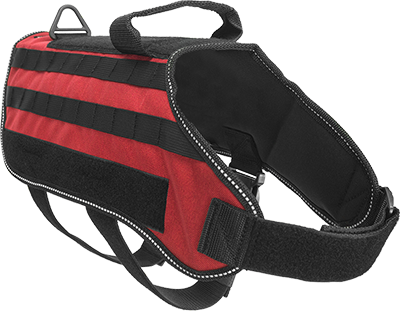 The adjustable chest/neck strap sits above the dog's breast bone eliminating any gap at the neck area of the vest. The lay-flat handle can be stuck down to the hook and loop when it's not needed. Designed in the traditional MOLLE fashion so you can use all MOLLE accessories with this vest. High quality poly webbing was used, and there are 13 colors to choose from with this vest. Comfortable wide grip handle and 1 V-ring which could be used with a leash.